Do Real Estate Prices Always Go Up? 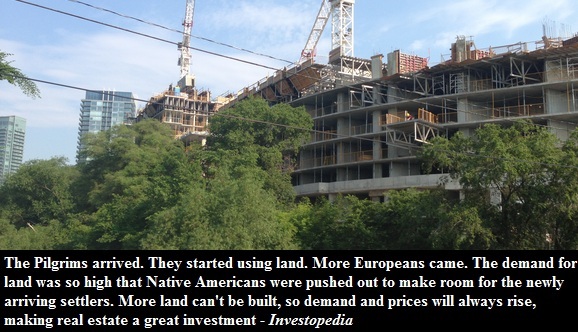 Of course real estate prices don't always go up. In fact sometimes home values can fall for a very, very long time. Take Japan for example, where housing prices were falling for over 20 years due to the burst of their housing bubble in early '90s and the aging population. But Canada is nothing like Japan. Our property bubble has not burst yet and the majority of the baby boomers are yet to retire. So why bother comparing Canada to Japan, or any other country for that matter? But if you can compare, then why not? 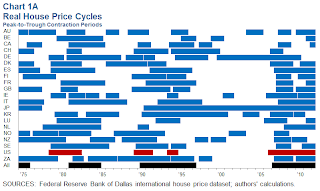 The graph below shows contraction periods of real home prices in various countries. Coloured periods indicate falling home prices (when adjusted for inflation), while white periods indicate increasing home prices. Note the following restriction imposed onto the graph below: each period of contraction or expansion must last at least 3 quarters. 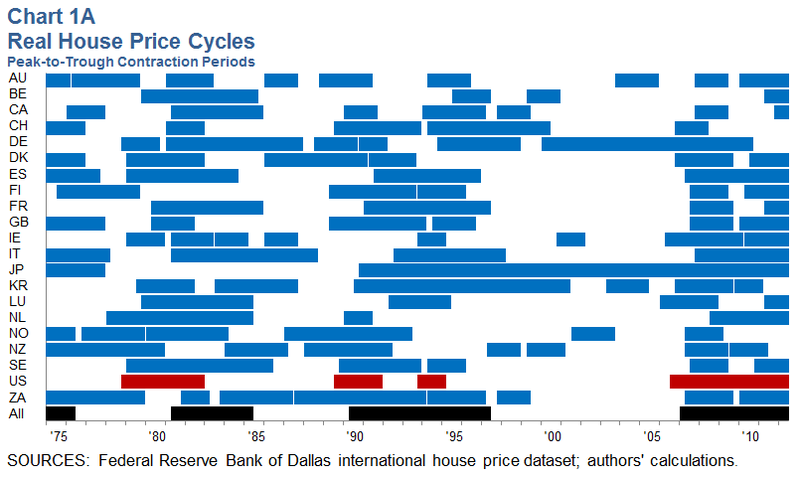 Notice how home prices were increasing in most countries between 1997 and 2007. Real home prices were only falling in Japan, Germany and Korea. In a way there was a global housing boom that lasted more than a decade. You may think that the prices were only going up in your neighborhood because it was special, yet the reality is that inflating real prices was/is a global phenomenon. During the financial crisis most countries entered a prolonged contraction phase. Some countries like Switzerland, Canada and Norway had briefly experienced falling housing valuations during the 2008 recession but afterwards home prices resumed their growth. Now let's compare the real income growth cycles versus real home price cycles. 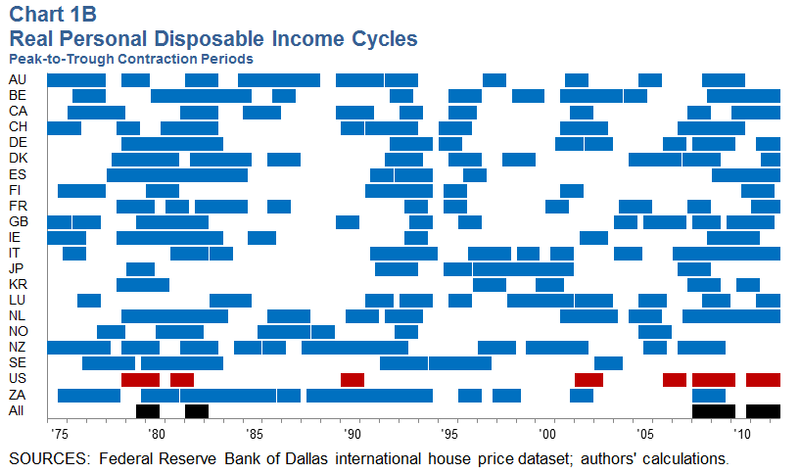 A chart below shows real personal disposable income cycles. Coloured bars indicate contraction phases while white bars symbolize rising incomes. 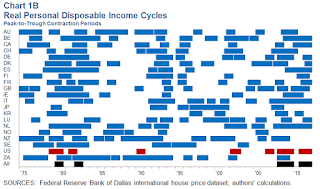 Note that restriction is imposed to avoid spurious cycles so each phase of expansion and contraction must last two quarters for real personal disposable income. One thing to keep in mind is that the above chart only shows when the incomes were rising but not by how much. Even though incomes grew more or less consistently between 1997 and 2007, they did not grow as fast as home prices. For example, consider my last post in which I compared Toronto's average home price versus average income.